In and around the State of California USA, especially where sunny weather, long uncongested roads and a number of vast dried up lake beds, allowed these early 'Rodders' to test their modified cars; which were easily recognised by their stripped down, bare bones appearance. Initially early engine modifications were few, a milled head, a second carb always with an unmuffled exhaust; the die was set, Hot Rodding had begun. !! Like their owners, the vehicles have evolved into a more dignified and diverse group, to the point where it is difficult to actually define a Hot Rod. Hot Rodding is perhaps a culture, as well as a description of a vehicle type, and a definition will vary from owner to owner. The most popular definition of a Hot Rod would be "a modified vehicle of American origin, originally manufactured prior to 1949". NZHRA members constitute the largest group of special interest and classic vehicle owners in New Zealand. 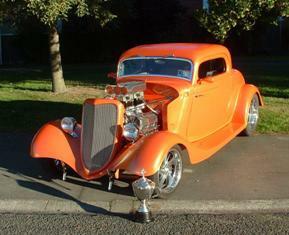 The vehicle types range from 1920's style cars, such as Model T Fords to modern day vehicles. Most have been modified in some way to reflect the taste and style of their owners, however in more recent years, many members have moved towards the trend of restoring those glamorous machines America produced during the 1950's and 60's as much as those building the more traditional "Hot Rod", based on pre 49 American body styles. NZHRA events and activities range from casual club picnics on Sunday, to National events requiring large budgets. Each year Hot Rod Clubs participate in various community displays and events, and support many worthy charitable trusts and organizations. Hot Rod runs can be likened to rallies, where touring stages on public roads, lead to sections where off-road games, involving driving skill take place, along with games and entertainment for children. Hot Rod displays and shows, ranging in duration from a few hours to four days, take place in various centers throughout New Zealand. Drag Racing took its roots from Hot Rodding, and remains closely associated today. The New Zealand Drag Racing Association (Inc) (NZDRA) is a sister organization to NZHRA. While NZDRA is responsible for 1/4 mile events, NZHRA administers events at temporarily closed road courses of 1/8th mile. Like all NZHRA driving skill and speed events, these events are always conducted in a safely controlled environment. They are all overseen by a national network of Official Area Stewards and Scrutineers, who apply and enforce the rigid vehicle, participant, and spectator protection requirements set down within the rules of the NZHRA. All sanctioned events are covered by Public Liability Insurance and are approved by a network of elected Regional Directors, who coordinate the list of events nationally with the NZHRA Office. Today's active Hot Rod enthusiast is not the often perceived young man of many years ago, recklessly driving a souped-up jalopy at breakneck speeds. While performance and individuality remain integral with Hot Rodding in the 21st Century, so too is refinement, detail, use of sophisticated and technologically-advanced componentry and construction methods, and innovative styling. The original vehicles from which the finished product evolves, are still the same as they were over half a century ago, although many are now fibreglass replicas. The componentry used in many cases, also of a modern, high standard in order to comply with the stricter standards required of all road vehicles. While young people are still, and we hope always will be involved, the average age of members of the New Zealand Hot Rod Association is in the mid-30's region with a significant proportion of members in their 50's and 60's. Partners and children are a big part of the Hot Rodding scene now in New Zealand, just as they are worldwide. Hot Rodders today come from all walks of life, with the highest proportion comprised of skilled tradespeople, managers and small business owners. Most are technically minded, and enjoy sharing ideas and learning from others like themselves, as in any other group or society. They also enjoy displaying their vehicles, in order to enable others to share in their enthusiasm and affection for unique and individual motor vehicles. NZHRA receives its delegated authority to conduct and administer Hot Rodding and Closed Road Drag Racing in New Zealand from the FIA (Federation International Automobile), which is the worldwide governing authority for motorsport, through its New Zealand affiliate Motorsport New Zealand. The New Zealand Hot Rod Association is an affiliate member of the New Zealand Assembly for Sport, which vigorously promotes the rights of all sporting groups.